Ensure that the regulator is fully off before you mount the regulator on the CO2 cartridge. Fill the diffuser-chamber with water. Place the cartridge in the rack, slide the suction cups on the hose and mount the hose to the regulator and the diffuser. Mount the diffuser with the suction cups at the inner side of the tank near the bottom and place the hose in the back corner. Leave the diffuser for 24h in the tank to ensure that the ceramic disc is fully moistened. Open the regulator carefully and count the number of bubbles per minute in the diffuser-chamber. Wait 5 minutes, adjust and repeat until the number of bubbles per minute is similar to the recommendation in the table. 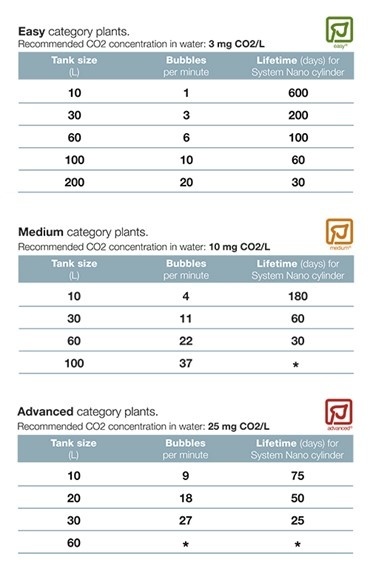 The table shows recommended dosage (bubbles per minute) in different tank sizes. A 95 g CO2 cartridge contains 50,000 ml CO2. The most important nutrient for plants is CO2. The natural CO2 level in an aquarium is 0-0.5 mg/L of water. Even the slightest addition of CO2 can make a big difference improving the growth and vigour of the plants. If the aquarium contains only slow-growing Easy-plants, the addition of CO2 gas into the water should reach a level of approx. 3 mg/L to ensure good growth conditions. 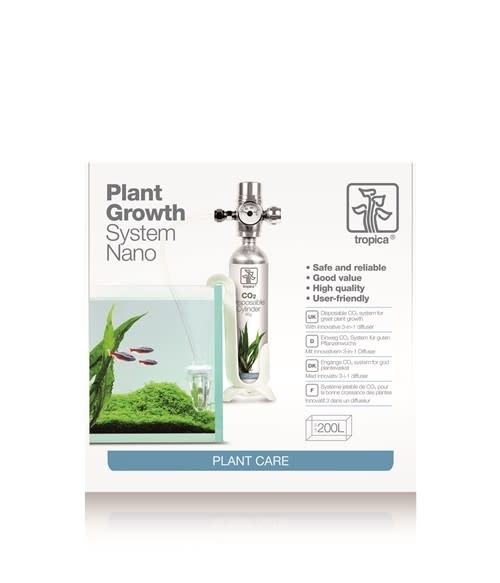 For Medium category plants the CO2 requirement is approximately 10 mg/L and for Advanced plants approx. 25 mg/L. 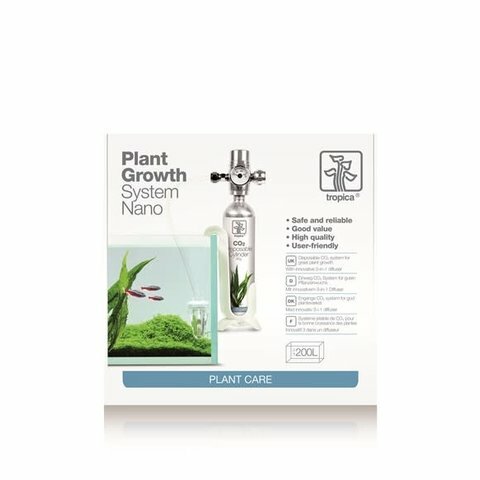 *) If you have a larger aquarium containing Medium or Advanced plants, the lifetime of a nano-cartridge will be too short. In this case we recommend a larger cylinder e.g. 2 kg refillable.